Alabama-licensed dietitians renew biennially on September 30th of odd years. 30 hours of continuing education are required to renew. Courses offered by CDR-approved providers are accepted by the board. No limit on courses earned online by approved providers. 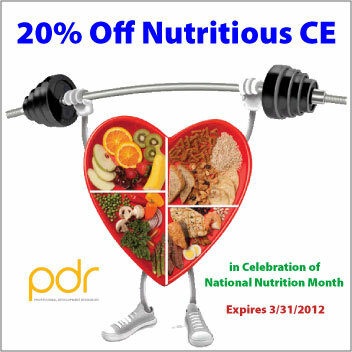 Professional Development Resources is a CPE Accredited Provider with the Commission on Dietetic Registration (CDR Provider #PR001). CPE accreditation does not constitute endorsement by CDR of provider programs or materials. Alabama-licensed dietitians can earn all 30 hours for license renewal in the comfort of their own home or office – anywhere with internet access! What Do You Know About CAM? 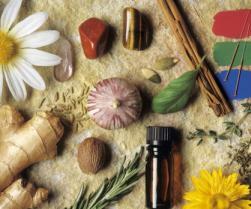 Alternative medicine can mean any healing practice that is not covered by conventional medicine. The most common are naturopathy, chiropractic, herbalism, traditional Chinese medicine, meditation, yoga, biofeedback, hypnosis, homeopathy, acupuncture, Unai and Ayurveda. The popularity of complementary and alternative medicine (known as CAM in medical circles) varies from country to country and from culture to culture. In Western countries, it is often used as a complimentary medicine in conjunction with or to complement conventional medical treatments and can be classified into five major groups: whole medical systems (including traditional Chinese medicine and Ayurveda); mind-body medicine; biologically based practices; manipulative and body based practices (including chiropractic and osteopathic manipulation); and bioelectromagnetic based therapies. According to the National Center for Complementary and Alternative Medicine (NCCAM), many Americans use CAM in pursuit of health and well-being. The 2007 National Health Interview Survey (NHIS), which included a comprehensive survey of CAM use by Americans, showed that approximately 38 percent of adults use CAM. Defining CAM is difficult, because the field is very broad and constantly changing. NCCAM defines CAM as a group of diverse medical and health care systems, practices, and products that are not generally considered part of conventional medicine. Conventional medicine (also called Western or allopathic medicine) is medicine as practiced by holders of M.D. (medical doctor) and D.O. (doctor of osteopathy) degrees and by allied health professionals, such as physical therapists, psychologists, and registered nurses. The boundaries between CAM and conventional medicine are not absolute, and specific CAM practices may, over time, become widely accepted. “Complementary medicine” refers to use of CAM together with conventional medicine, such as using acupuncture in addition to usual care to help lessen pain. Most use of CAM by Americans is complementary. “Alternative medicine” refers to use of CAM in place of conventional medicine. “Integrative medicine” (also called integrated medicine) refers to a practice that combines both conventional and CAM treatments for which there is evidence of safety and effectiveness. Despite the arguments for or against complementary, alternative, or even integrative medicine, the fact remains that healthcare consumers want to know their options. If they read on the internet about an alternative ‘cure’ for their son’s Autism, they’ll (hopefully) ask their healthcare provider for more information. For this reason alone, healthcare providers need to educate themselves so they can, in turn, educate their patients. Professional Development Resources offers two continuing education courses for healthcare professionals that address various CAM modalities. Both courses are based on a series of live lectures given by NCCAM experts and are transcribed verbatim.